« Cast Yourself in The Loan Ranger! Walking on Sunshine, our latest Starring You video, is sure to be the feel good hit of the summer. We started production in winter, but luckily JibJab is located a block away from Venice Beach in sunny Los Angeles where it’s pretty much summer all year round! We started with the song choice and a vague idea of the theme – fun, partying, summer, pool party, etc- and just started drawing! A whale of an exit. However, before we could hit the beach we had to make an animatic. As the animatic developed, some of the gags got cut and we added in the idea of surfing. How Californian of us! When we were happy with the animatic, we started brainstorming some visual ideas. Once we had an idea of the style for the card, we hit the beach for some visual development! That’s right – we went to the beach for completely legitimate work purposes. We shot some test footage, then we collaged it together into a video with our designs to see if our concept would work as well as look cool. This is where we came up with the methods of filming the effects like splashes. We used a highly technical technique of throwing sand into the ocean (it’s okay, it came from there in the first place). We filmed the splash, then used After Effects trickery to separate it from the background and put it where we wanted in the video. For the character that is buried in the sand, we literally buried Jeff’s arm (the director of e-card’s arm) in the sand and filmed him ‘escaping’. Once again, we found that we could whip up something that looked pretty real with a bit of masking, rotoscoping and colour grading in After Effects. After the test/research/hang at the beach phase, we were ready to go full force in production…which unfortunately meant going back to the beach to shoot more footage with a proper camera. Gnarly brah! 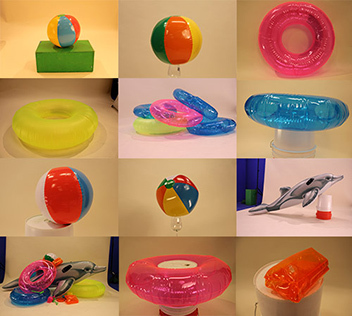 We also purchased a lot of pool toys so we could take photos of them in the studio at lots of angles that we might want to use in the animation. This was a challenge as the crew were new to lighting a studio, but they overcame all obstacles with lots of enthusiasm and only one broken wine glass (which was being used as a prop stand). Then, as the sun really started to shine for the beginning of Summer, we returned indoors to our computers to animate the entire thing in After Effects. 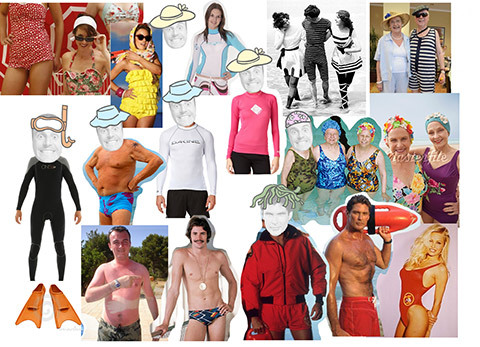 It was lots of fun making the silly characters’ butts wiggle in their ridiculous swimsuits! We think the finished product has a lot of energy and a lot of laughs. I guess we’ll celebrate by hitting the beach! This entry was written by paulhanges and posted on July 8, 2013 at 10:22 am and filed under Behind the Scenes, Fun with the Site, General, How-To, Inside JibJab, jibjab, New Content, Production Art, Talent, Team JibJab, Uncategorized. Bookmark the permalink. Follow any comments here with the RSS feed for this post. Trackbacks are closed, but you can post a comment. Hi Wayne, if you have any payment questions, please contact our customer service team by emailing help@jibjab.net. They can take a look at your account and answer any questions for you. Thanks!